Hey ho hunterino! You’re moving on from Moga, Dundorma and Bherna and heading to the New World to continue your hunting exploits, are you? Don’t forget to bring back a souvenir! But not Dung. That wouldn’t be cool. The Monster Hunter Franchise is a series I’ve put more time into than planning for my future. 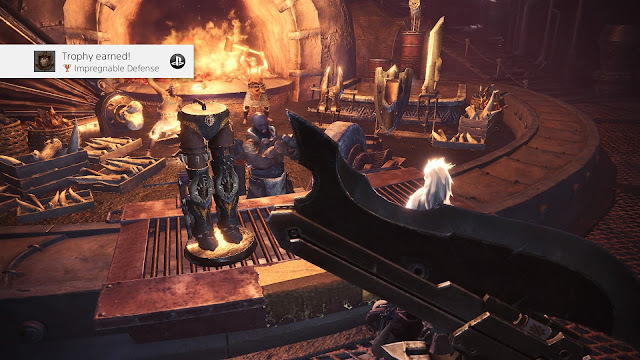 With an average of 400 hours per game since 3U, and with my first being “Monster Hunter” for PS2, I’ve been hunting for quite some time, and I feel confident in saying that Monster Hunter World really outdid itself. 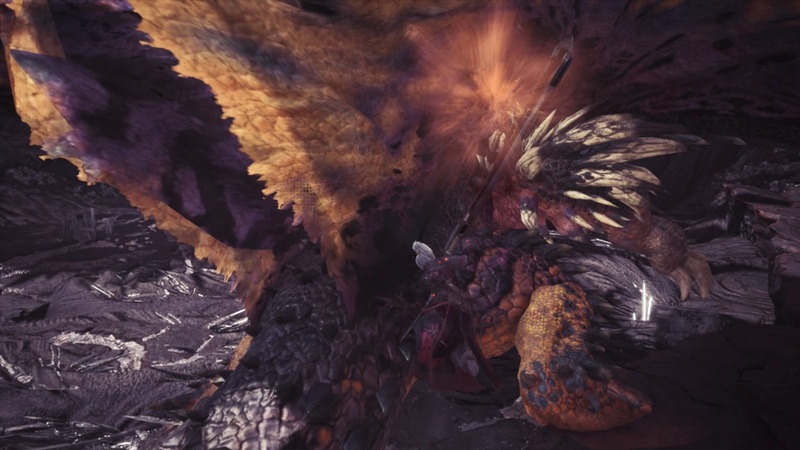 Whether it be the ease for new players to get into, the ‘honed’ weapon movesets, the gorgeous environments, or the quality of life improvements, Monster Hunter World has something for veterans and newbies alike. The basic premise of Monster Hunter in general is pretty simple: there are large creatures threatening people, and you need to take them out. While the franchise has never really been a particularly plot focused game in the past, it has been progressing to actually giving out a storyline. In the case of Monster Hunter World, this story is about you, the new hand picked hunter heading off to the ‘New World’, where elder dragons (the beefiest of monsters) apparently migrate to every decade or so. It is your job, along with your trusty(?) handler to solve the mystery of what’s going on. Of course you’ll also bee smacking large monsters upside the face and turning them into pants. I recall a while back someone described Monster Hunter as basically “all the grinding of an MMO with none of the MMO”, and honestly? They used to be right. While it’s still somewhat true, a lot of the most annoying or infuriating parts of the series have been trimmed out, or refined. 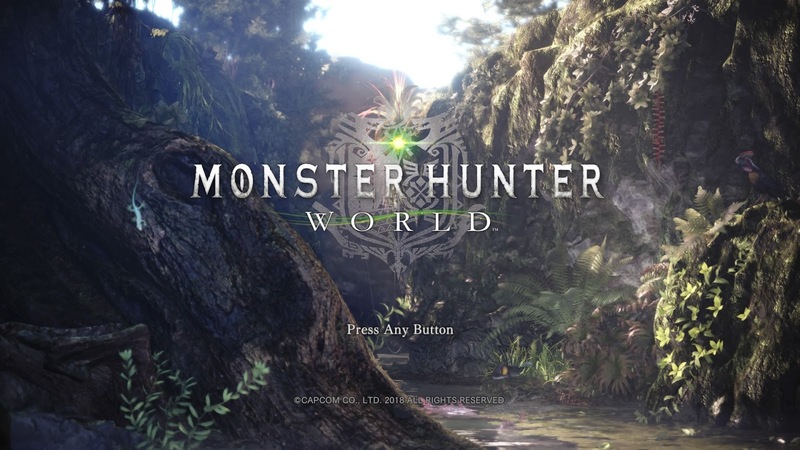 So let’s jump in and give all you rookie hunters a breakdown of what’s going on in the world of Monster Hunter! Essentially, you’ll be taking quests in your town hub, and then leaving to go search for and beat up one of the local critters that happen to be causing havoc for you and your crew. In your hub town, there are a lot of new aspects that veteran hunters may be pleased to find as well. You’ve got plenty of item boxes scattered about the hub station, which you can use to prepare your equipment and items before heading out to battle. New to world, there is a research station, which will give you more info on monsters the more you research them by either finding their traces or fighting them. The research station basically adds a mini Kiranico to the game, which is super helpful for learning monster weaknesses and drops without having to go Google them. The melder is back for your gems and decorations, except there are two differences this time around. First, the decorations are basically one off skills, since the entire skill system has been revamped, and second (and most important), the melder can make you items. Yes, plates and gems count. 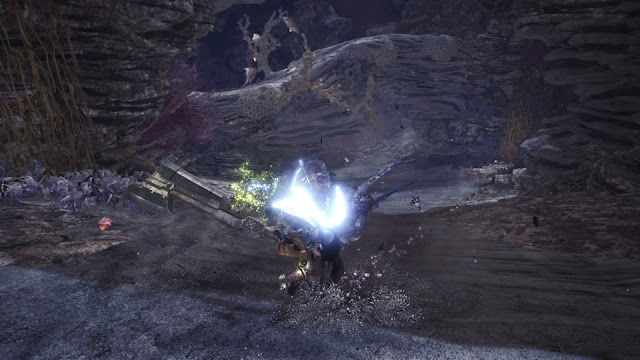 No more farming G rank Alatreon for two hours a day hoping for that Azure Dragonsphire you need. Although the Skyswayers are a different story. Generally, these rare parts can be “traded” with the melder for the special tickets you get from the limited bounties, whereas as common materials can be interchanged. So what are these limited bounties then? Well, they’re basically what the fetch quests have turned into. No more annoying “collect me four choice mushrooms!”. Instead, they’re now continuous requests that you can take multiple of, and turn them in for armor spheres and resource points. The rookie hunters are probably antsy to know what you do in the field by now, so let’s go on a little tour! Once you’ve accepted your quest, or left on your freeplay expedition, you get sent to one of the base camps you’ve set up in the area you’re active in. Base camps can be created by finding an available location while out exploring, and then providing some materials to make the camp back at base. Whether it be a quest or exploration, you can track monsters by finding their traces, and your scoutflies will eventually hone in on the scent and guide you to the monster, even displaying its location on the map, and if your tracking reaches max level, it will even display the monster status on the map, such as if it’s capturable or hungry! The more you fight a monster, the more you get a transient bonus that starts your scoutfly tracking level higher, and also a research bonus that increases the points awarded for discovering tracks. So how do you beat up these monsters? Well, you have your choice between a myriad of different weapons to choose from. You’ve got your heavy weapons, like the greatsword and hammer, the light weapons like the dual blades and sword and shield, and your ranged weapons like the bows and bowguns. All these weapons, and more, have been refined since Monster Hunter Generations, and even include elements of the different styles that were introduced. I should make this readily apparent, but there are no levels, exp, or turn based systems at play in Monster Hunter, or at least not the main games. This is all “live action combat”, where different button inputs will give you different moves or a dodge roll, and don’t expect a lot of invincibility time from your roll (read: hardly any). Each weapon has its own usefulness and method of use, so I can’t really give you any tips per se, but check out GaijinHunter’s videos if you need some more in depth tips and tricks (provided I’m allowed to say that in here). Personally I prefer smacking something upside the face or hacking its tail off, so I use a Switch Axe as my primary, although I also dabble with whatever else I have lying around too. Made a whole lot easier since you can change gear at the base camps now, and also eat in mission, in case you’ve forgotten. Totally the best addition in my opinion. 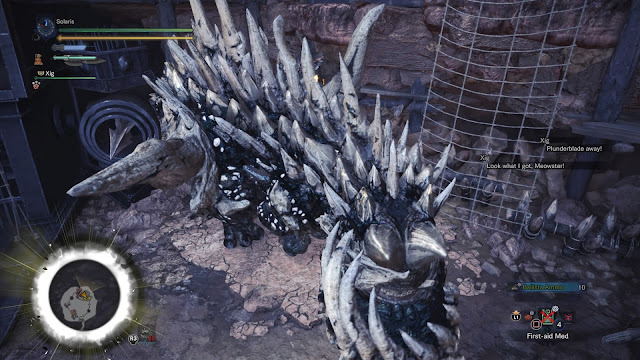 After you’ve killed or captured your prey, you’ll receive monster parts as rewards, which you can use to create new armour and weapons to hunt bigger and burlier creatures. Rinse and repeat, basically. Some changes from previous instalments are the introduction of the tools/capes. Basically, you have a capture net, whetstone, and fishing rod that are always a permanent part of your items, even without needing them in your limited space item pouch. Also, the whetstone is infinite use and you can sharpen without sheathing, which is awesome. The fishing rod isn’t particularly useful though, since you can throw the capture net at fish to catch them. Or use it to set off bombs, which I found out by accident. 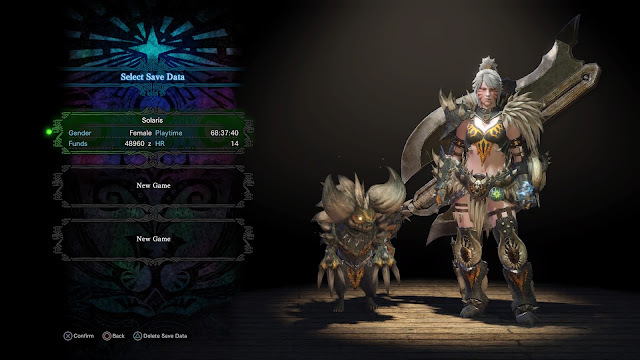 While Monster Hunter World is a serious improvement on a lot of the old games, there are a lot of rough spots in it, so I’ll take this section to go through some of the things I liked to see, and some of the things I think could’ve been better, at least from a veteran hunter perspective. First up, the item pouch no longer also holds your monster carves, so you don’t need to constantly have free space for your carves when you could be stocking more nullberries or potions. The new weapon trees are a bit of a mixed bag. On one hand, you can actually see the upgrade tree now, which is beautiful, and you can “regress” a weapon to get materials back. On the other hand, the diversity in available weapons feels severely lacking. Basically, if you want an elemental weapon, you’ve only really got two choices as a maximum, sometimes only one, like with the water weapons that are only Jyuriatodas, at least as far as I’ve seen. Also, the weapon appearances are kind of disappointing, as most weapons look really similar to each other. After finishing a quest, you can stay in the area to immediately start an exploration, and you can also transition into quests since the handler follows you around, which cuts down the load times. Skills attached to armour/decorations/charms are now “one-offs”, and most will stack, whereas they used to generally be single skills, but require a certain amount of points to activate. It makes making a mixed set easier, if you’re one of those unstylish plebians, but a lot of the skills that used to be “whole”, like awakening, are now split into parts. The refined weapon movesets are absolutely great, and I keep finding new combos to play with that you couldn’t string together in previous games. Personal favourite is continuously swapping between S.Axe modes for a continuous roundhouse swing. So beautiful. A lot of the weapons have seen significant improvement. For a bit of a negative side, it feels like there are too few quests, and that most of the development went into the new areas, and the investigations, instead of more traditional quests, which I was a little disappointed to see, but the addition of bonus rewards for investigations make armour set/weapon farming a lot more manageable. The balancing between multiplayer and solo play is what I can only described as “horridly skewed”. Whenever you’re in a public room, the up to other 15 people in the room have full access to any quest you post unless the party limit is reached or they don’t meet the storyline/hunter rank requirements. 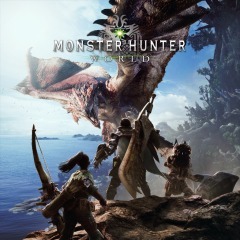 This is great if you’re looking for drop-ins, but my problem is the fact that monsters get scaled to what feels like a three person party of average hunters. A lot of the time I found myself starting a quest, only to have a single hunter join in, which raises monster stats, as apposed to them simply being more aggressive like in some previous games. Now, while I can take these harder monsters fine, the hunters joining me generally couldn’t. Like, at all. I had one chump join me for an Anjanath hunt who didn’t know he could roll to put out fireblight (and blastblight, for that matter), and he never once drank a potion that I could see. Cue him dying three times and having my quest fail. This also happened during my attempt to farm a Nergigante armour set, which was infuriating. Just be aware that teammates aren’t always going to be helpful for you. And if your teammates bail out of the quest? You’re still stuck with a harder creature. Which brings me to a point I’d like to make: please be aware of online etiquette when hunting with others. It goes a long way to ensuring future Rookies will enjoy their experience. I’m looking at you bow/bowgun users and Longsword users. I even ran a longsword for a long time previously, and I’m getting fed up with some you. There may not be “friendly fire”, but you can still flinch other players. Please be aware of your positioning. That being said, the 16 player rooms are great for drop-ins, which never used to be possible before, and with the new SOS flare, people in different rooms can join your quests if you fire the flare off, making the community a lot bigger part of the game this time around. One of the cool aspects they’ve revamped the Elder Dragons with is a “last stand” mode when they’re almost dead, which is basically a super rage mode, coupled with the new elderseal status which is supposed to help with that, or something? It’s still debated as I’m writing this, although it does add an interesting new element to the game. The only last real complaint I’ve got is that it seems you get stunned a lot more frequently than is anywhere reasonable. Like, at all. My current record is a whopping 17 times in a 7 minute hunt, and there weren’t even any enemies around that gave thunderblight. I can assure you that little is as infuriating as getting hit by a miniscule damage attack only to be stunned, and then have a Teostra Supernova you while you can’t move for an assured cart. Speaking of Teostra, whoever decided what its last stand would do in its nest wins the douchebag lifetime achievement award, although as long as it isn’t in its nest it’s fine. Apart from a few setbacks and aspects I felt could have been a lot better, Monster Hunter World sports some amazing graphics that had me admiring the views, before getting thrown off a large cliff by a wyvern mind you, but the view was stunning as I fell as well. The monsters are super nice looking as well, and the dynamic weather and night/day systems in each of the areas were really something I enjoyed seeing as well. 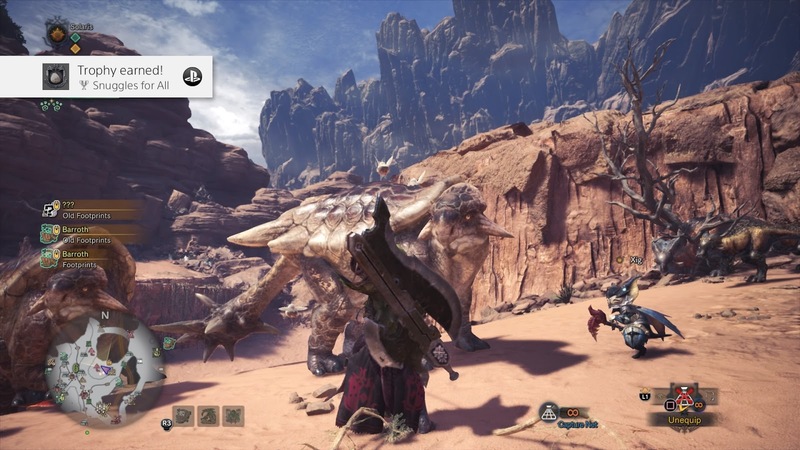 Fighting a Barroth in a sandstorm just felt so right for some reason. It’s not like the music will let you down either, the soundtrack is really amazing. 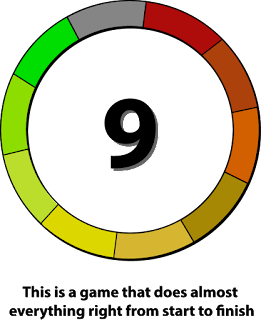 Especially the new arena theme, it gets a top score from my rating. Basically whether it be new hunters or old hunters, there’s something here for everyone to enjoy. With a stellar soundtrack, beautiful environments and creatures, a plethora of easily accessible weapons, a variety of creatures to fight, there’s a lot of good times to be had by all.